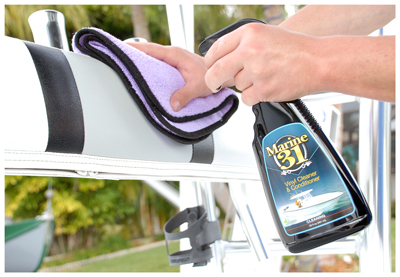 Marine 31 Vinyl Cleaner & Conditioner gently cleans and protects all marine vinyl surfaces in one simple step. Gentle cleaners remove ground-in dirt and grime while Ciba Tinuvin UV Inhibitors protect against harmful UV rays to prevent cracking and fading. Vinyl surfaces will retain their color and texture when regularly treated. Water-based formula ensures the surface isn�t left sticky or greasy. It�s a fact: there isn�t one person that would rather spend time tending to their boat�s vinyl surfaces instead of piloting it out on the open water. The folks at Marine 31 feel the same way which is why they formulated a product that cleans and protects vinyl surfaces in one simple step. Say goodbye to multiple cleaners and protectants and say hello to Marine 31 Vinyl Cleaner & Conditioner! The sun�s ultra-violet rays take a toll on your boat�s plastic, rubber and vinyl components, often leaving them dry, cracked and faded. While most UV protectants claim to provide durable protection, the fact of the matter is if they don�t contain Ciba Tinuvin UV Inhibitors � the most advanced and effective UV protectant � they aren�t doing much to prevent cracking and fading of vinyl surfaces. Marine 31 Vinyl Cleaner & Conditioner is formulated using the highest amount of Ciba Tinuvin UV Inhibitors available in a vinyl protectant. Marine 31 Vinyl Cleaner & Conditioner breaks the mold of traditional one-step products by providing the benefits of two separate products � a cleaner and a protectant. Marine 31 Vinyl Cleaner & Conditioner is capable of removing ground-in dirt, stains, body oils, food spills and more. While it�s hard at work releasing grease and grime the Ciba Tinuvin UV Inhibitors are being absorbed into the surface, providing long-lasting protection against the outside elements. Shake well. Do not apply to surfaces where grip is of concern. Spray a light mist directly onto the surface or onto a microfiber towel. Gently massage the product into the surface until soiling is removed. Flip the towel to a clean side and lightly buff the area. For maximum protection, apply a second coat and allow to penetrate for 5 minutes before removing any excess. Heavily soiled surfaces may require scrubbing. We recommend using the Tampico Upholstery Brush.